This photo gave me an instant connection to some from my 3rd cousin’s photo albums. This particular cousin, Nora, has provided me with so much information over the years: old histories, photos of my Kunkel ancestors and our mutual O’Brien relatives. I owe her an enormous debt in terms of what she’s given to my research, which is why I asked her to launch my Kunkel family history book. Cousins meeting at Circular Quay, Sydney. The American with glasses is not a relation. The three on the left are 1st cousins, once removed to the American on the right and his first cousin Nellie Garvey. During World War II, many American soldiers were stationed in Australia, and to be honest they weren’t all that popular with the Aussie men who were left behind for whatever reason: the snapshot phrase was that they were “overpaid, oversexed and over here“…a case of jealousy I fear. 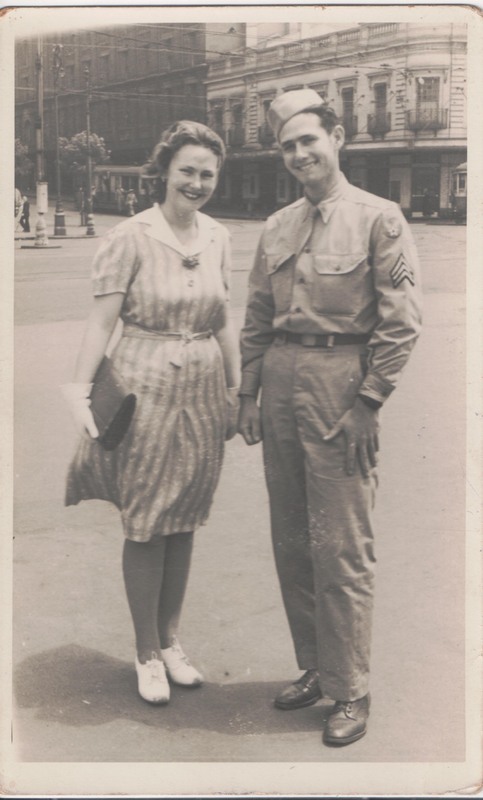 The girls were not so reluctant to meet these men, and many married and became War Brides, relocating to the United States after the war, some successfully and some not so much. I think the American GIs had rather more finesse when it came to women than the rather blunt Aussie style. Two cousins meet: John Garvey (USA) and Reg Gill (Sydney). However in some cases this wasn’t all about the whole “boy meets girl” story, it was about cousins meeting cousins from across the world. This particular branch of the O’Brien family descended from Honora Garvey nee O’Brien from Bodyke County Clare, one of my Mary (O’Brien) Kunkel’s siblings who remained in Ireland. However Honora’s children were, and are, part of the great Irish diaspora with some moving to the States and some moving to Australia. I wonder why, and how, they came to the conclusion regarding which place to choose. No doubt the increasing literacy of the Irish population assisted this branch of the family to keep in touch over the miles and the years and across vast distances. 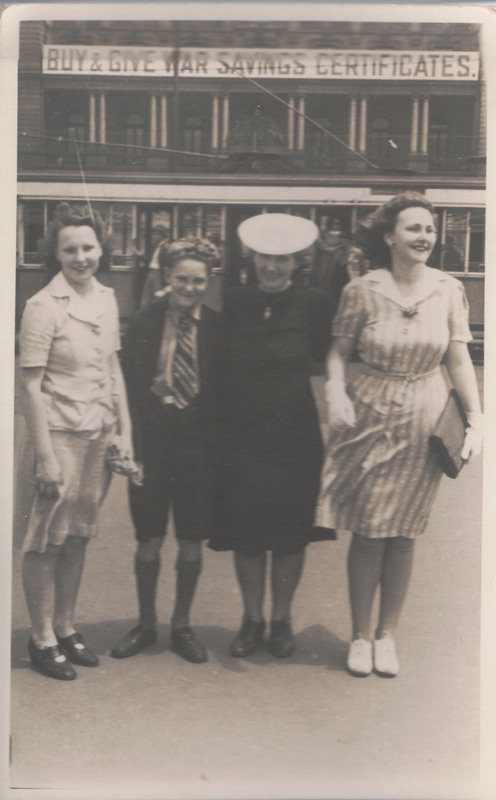 The Sydney siblings, Nora, Kevin and Marie with their aunty Nellie (in the hat). I like the war bonds notice on the building. I was intrigued that Marie was the only woman wearing gloves as I’d have expected the to be de rigeur in this era. Those 1940s shoes were really not glamorous. I can’t quite figure out what Nora is carrying…is it just a purse? The war provided a chance for the cousins to meet. On reflection it seems possible these photos were probably taken by the street photographers that have been the topic of blog posts lately…it just hadn’t occurred to me…we do tend to assume that cameras were as readily available then as they are today. 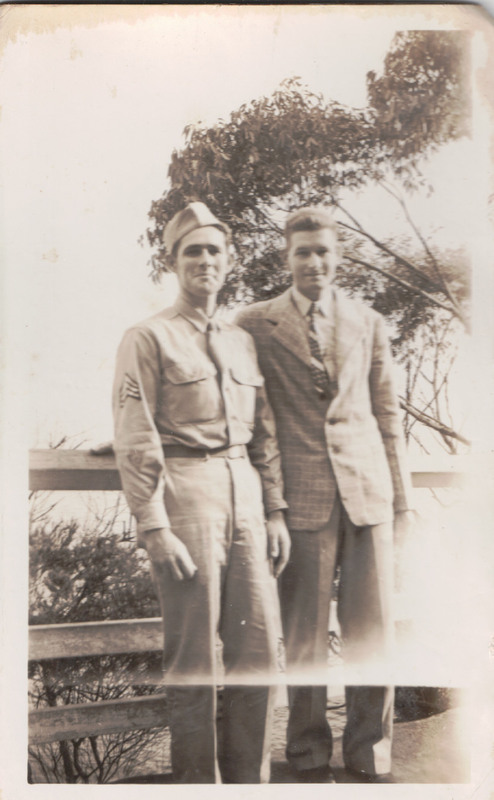 On the other side of the Pacific, two other Aussie cousins were being welcomed by the American branches as they commenced their WWII Air Force service. These connections, many years after their grandmother, Honora Garvey, had died, reinforced the kinship links. No one remembers what this guy’s name was…will anyone recognise him I wonder? So today we have a bunch of cousins and a ring-in GI mate, whose name is no longer recorded…I wonder if anyone will recognise him? Why not march over to see what other Sepians have made of this week’s prompt? And because I’ve found an image among Nora’s collection that suits last week’s image very well I’m going to post it here as well – I’d forgotten all about it. The reverse says “Michael Keane and friend” circa 1900s. He would also have been 1st cousin to John Garvey in the photos above. 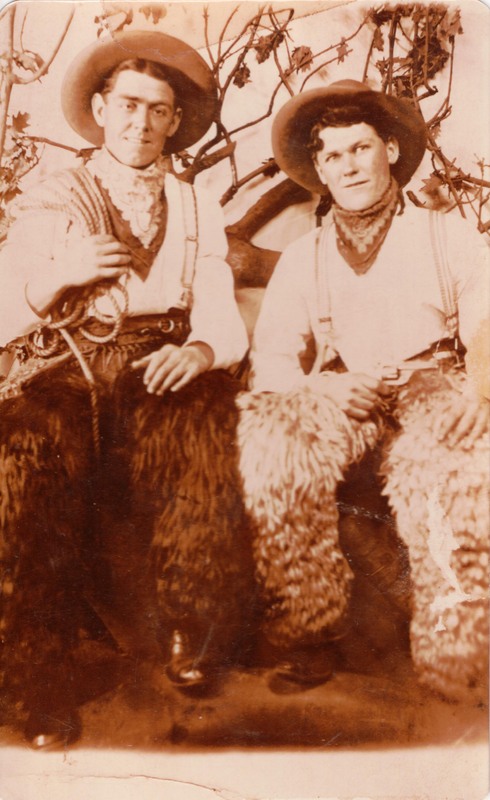 Their chaps look as woolly as the dog in the featured image. This entry was posted in Australia, Broadford County Clare, Irish family history, O'Brien family, Sepia Saturday, World War II and tagged Garvey cousins, Sepia Saturday, WWI GIs by cassmob. Bookmark the permalink. We gad the sam saying about the GIs in Britain too. Although we never saw any in our village. Interesting group of folks from across the world. Thanks Bob. I guess they were paid so much more that the local men were pretty jealous….plus they had the advantage of being “exotic”. the phrase “cousins meeting cousins from across the world” struck a chord with me Pauleen as I had recently been researching the war service record of my NZ great grand uncle in WW1 and it was recorded that he had visited Fraserburgh, Scotland while in the UK. His parents had migrated from there about 40 years earlier so he was probably visiting cousins as well. He probably was Kerryn. I imagine many of the ANZACs did exactly that when they knew where their rellies had come from. Family anecdote suggests my grandfather visited his wife-to-be’s family in the UK. 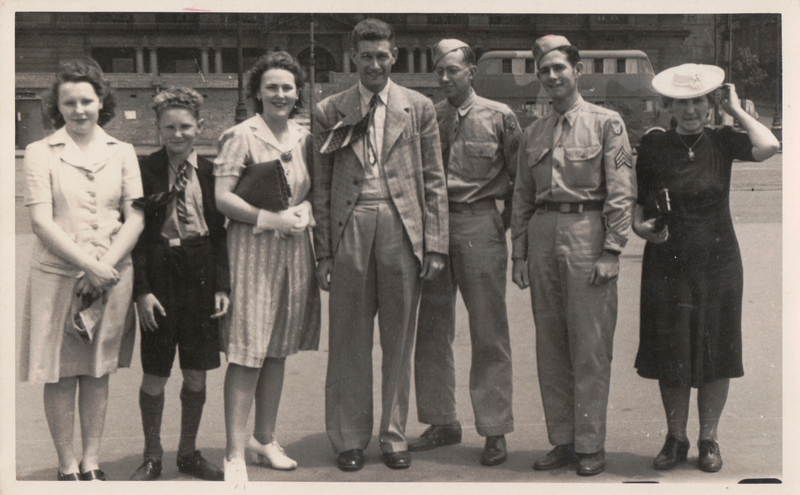 Having an opportunity to meet relatives – or even possible relatives – from all over was a positive part of the war. I used to hear there are only six degrees of separation between all of us, but with the world’s population increasing faster & faster, it might be seven or eight degrees by now? You might be right about the 7 or 8 degrees of separation but then in most of the 1st world the population isn’t growing that fast, so perhaps not. I know these cousins enjoyed the chance to meet up. Now it is easy for us to travel to the other side of the world. However back then it would really have been a big deal! Yes indeed Sharon -it’s sometimes hard to recall how reduced airfares, technology and a more affluent lifestyle have changed our ability to connect with family. There are some wonderful images to explore here. Each one of them was well worth clicking to enlarge and investigate. Thanks for sharing them. Thanks Alan….glad you found it interesting. 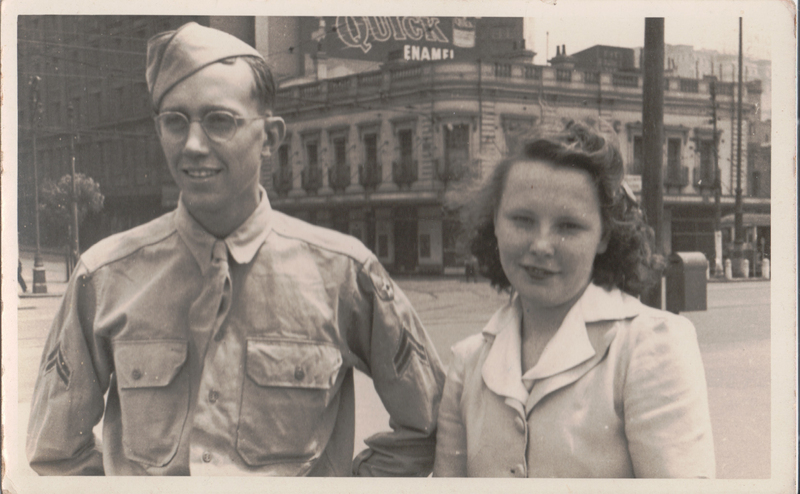 The possibility of a family reunion is one aspect of war I had never even thought about. The observations about those slick American GI’s are amusing. I grew up in a Navy town, and I loved to go downtown when foreign ships were visiting. It was fun to see uniforms from other countries, but more fun to see if I could catch the eye of some exotic sailor. I can imagine that would be an attraction Wendy, especially in the teenage years. I remember when a French submarine came to Brisbane when I was a teen – it was docked below our school. Can you imagine the interest that generated even in the well-managed private girls’ school?! Let’s hope somebody remembers the ‘guy in glasses’; I had to enlarge the picture as I couldn’t tell he was wearing them. That’s quite a neat link – woolly legs=woollydog! Wouldn’t it be great Little Nell? As always, a very thought-provoking post Pauleen. It looks like it was a breezy day..perhaps the girls had both lost their hats for decided it wasn’t worth the hassle of chasing after them all day. Maybe, but I suspect not…both girls were still in their teens, though they don’t really look it. I was surprised at the absence of gloves…didn’t everyone wear gloves to town in those days?